A few years ago, I took a psychology class at the local college. Incidentally, if you ever take a psych course, you’ll often find yourself self-diagnosed with almost every disorder found in the DSM-IV. It’s almost a guarantee. The only one I was fairly sure I didn’t have was paranoid type I schizophrenia. Now, I know that relieves most of you who live far enough away, but to my dear friends and neighbors, thanks for sticking by me despite my idiosyncrasies. The scary revelation is that it turns out that I am more normal than most of your neighbors. Of course, that depends on how one defines normal. I do have a point I am working up to just for dramatic effect here. In the course syllabus, there was a self assessment assignment filled with several personality tests, and general mental health and wellbeing surveys. One of them evaluated how we felt about getting older. Part of that exercise asked us to cut out a picture of what we thought we would look like as we got older. I had a distinct advantage on this level as I had twenty-five years head start over the oldest one in the room besides the professor. I found a great picture of a woman with silky gray hair and perfect skin and I thought, probably not what I would look like, but what I could begin to pray for! Getting older never has bothered me. I always have thought that feeling old is what we have to guard against. Our actual age is only a number and hopefully a testimony of a life well lived. And what, you’re probably asking, does this have to do with “Leave it to Beaver?” Well, today I found another role model. I was watching on the news (okay, slight exaggeration–Good Morning America), that the old TV show “Leave it to Beaver” premiered on this day fifty years ago, and there she was, “June Cleaver” a.k.a. 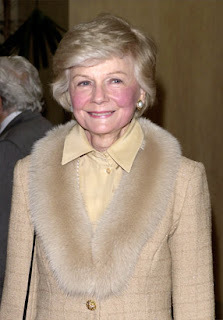 Barbara Billingsley, at ninety-two years of age, and she still had that sparkle in her eye and looked fabulous. I know full well we have little choice in the whole process as we age, but here is a woman we can enjoy and learn from if attitude counts for anything. If I do have the opportunity to grow old, I hope to have the same joy and sparkle. I think I’ll go put on my pearls. I feel the same as I did when I was 18, but every now and then I get a glimpse of my mother in the mirror! I was the only one in our family of 9 who never smoked. I was sure I could watch them get the wrinkles… wrong! Oh well! Praying we all get to have the opportunity to grow old and have the wrinkles. Who knows, they might be “in” soon!